Sometimes we enter an AAU season with a picture of who the top players could be and what to expect from various teams on the circuit. This year, our Generation Next Basketball Association had a newer program come in from Texas and kind of take the group by surprise with the way they compete and fight game in and game out, in 3D Empire. One of the players that was leading the charge for their success at the 16U level was the gritty, skilled 2020 guard Logan McLaughlin (Hebron H.S.). The junior out of Carrollton, Texas was a fun player to watch lead with teammates who were always out to compete at a high level. Standing with a 6’2” and 175-pound frame, McLaughlin also has some nice spring, he’s fast up the floor and he is a gritty defender with long arms which he uses to disrupt passes and force turnovers. Overall, the talented guard has developed his skill-set where he can play both guard positions effectively, and frankly he took over games often with his efforts. “One of my strengths is that I can push the ball up the court and get the defense on their heels,” McLaughlin said of what he feels he does really well on the court. He continued, saying “After getting to the paint for layups and kick-outs, the defense continues backing up and I can just get into a dangerous pull from anywhere.” McLaughlin is spot-on too, because this past spring/summer he helped his team by making plays with his shooting on top of making plays to get his guys involved. As this year moves forward, he says he is continuing to develop strength with the ball in his hands in order to make it even more natural. Over the course of the past year McLaughlin has had some big ups and got the attention of a lot of people on the circuit with the way he plays. But McLaughlin also enjoyed playing with his team and battling out wins. “This summer, my team only had 5 or 6 players at times, and even though that being said, we always fought against really good teams and ended up going deep into tournaments.” The 6’2” guard also noted some accomplishments such as reaching the championship in the 16U Association for NY2LA Sports. With the school season coming up, McLaughlin has high hopes for his Hebron squad as well, as he wants to help them get deep in the playoffs and win as many games as they can. The team graduated several seniors off last year’s group, so McLaughlin will be relied on as a young leader looking to use his talents to push them towards reaching their collective goals. As mentioned, Abilene Christian came in with that offer after seeing what McLaughlin can do on the court and the quality of person he is off the court. Such offers are likely going to continue coming over the next year. 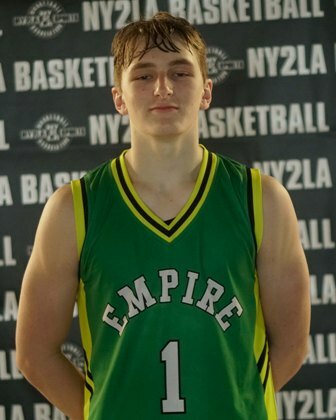 With his recruitment getting hot, McLaughlin has picked up good interest from schools like Kansas State, Oklahoma State, Colorado State, Creighton, Oral Roberts, North Texas (UNT), UT-Arlington (UTA), and Utah State. More eyes will certainly be on Logan McLaughlin as he takes the floor in competition next with his Hebron H.S. teammates. They’re scheduled to kick off the season on November 5 against Plano West H.S.